Scottish High International School is an authorized IB World School imparting the IB Diploma Programme for XI and XII, the national curriculum ISC for class XI and XII, ICSE for class X and Cambridge IGCSE for classes VI to X. The school is an authorized IB World School for Primary Years Programme (PYP) from Pre-Nursery to GradeV. Each child at Scottish High is groomed in a rich and stimulating environment with warm, loving and supportive teachers whose primary goal is to help the children find their own roots and wings. The nonpressured atmosphere helps our little ones acquire a solid sense of security, positive self-esteem, and a long-term enthusiasm for learning. Our aim at Scottish High is to raise lifelong learners who in their own way, are able to make a positive difference in the present global environment. We at SHIS are looking at empowered learners who understand and abide by our motto- Interrogo Percipio Adicio which means Question, Understand, Apply. With an envisioned anchor, Cdr. Kartikay Saini and with a dedicated Core Management Team, Scottish High is bound to sail towards the golden horizon of’Set Principles and High Standards’. Scottish High International School is a day long boarding school that offers a diversified curriculum that suits the needs of the digital era. It sets a platform for students who have plans to pursue further education confidently not only in the country but abroad too. The school has partnered with the best institutions around the world for learning and growth opportunities for the students and staff. Scottish High International School follows ICSE pattern. The school also offers globally accepted Diploma Programme (DP) of International Baccalaureate (IB) Geneva as well as IGCSE curriculum of Cambridge University. The school provides multiple options for the students of XI and XII standard. The students may choose either nationally reputed ISC curriculum or internationally acclaimed IB Diploma. The school has affiliation with Cambridge University and is an authorized Cambridge International Center for teachers and trainers diploma and certificate courses. It is also associated with the British Library and American Library. Working parents have the advantage of leaving their tiny tots under professional care in the daycare centre specially set up for this purpose. This makes Scottish High International School as a preferred choice for the students in the region. In the primary classes, Scottish High follows a programme that is designed to develop students into global citizens who acquire a range of essential skills and attitude that help in developing them into self-motivated, caring and balanced individuals with moral values who would be ready to face the challenges of the future positively and comprehensively. The students of the age 3 to 12 years are taught integrated topics in subjects like Science, Maths, Social Studies along with Language and Communication Skills, Arts, Music, Dance and Physical Education. This international trans-disciplinary programme provides a framework that consists of five essential elements – concepts, knowledge, skills, attitude and action. The students understand the concepts through questions; develop skills through thinking, analyzing, evaluating, communicating and decision-making. A set of an attitude of the students are fostered for them to feel, value and demonstrate. These are tolerance, respect, integrity, confidence, commitment and appreciation. These help them in decision-making and taking appropriate actions. These qualities the child carries throughout the life and helps lay a strong foundation for the child’s growth. 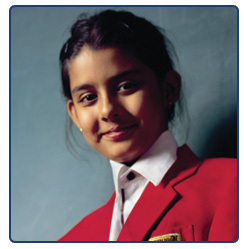 Scottish High International School is an IB World School with effect from 16 th March 2009 for its Diploma Programme. The authorization visit of the Diploma Programme took place on 2 nd to 4 th February 2009 by Mr. Stuart Jones. The school had a pre-authorization visit on 22 nd August, 2008. The Preliminary visit by an IB official took place on 24 th and 25 th November 2006 by Mr. Bill Fenton. The Pre Auth visit was held on 18 th September 2008 by IB officials. The evaluation visit was held in Feb 2013.